Newport Polo congratulates the winners of the inaugural East Coast Open Women’s Polo Championship (14-20 goal) & East Coast Handicap Women’s Polo Championship (8-12 goal) Sunny Hale Legacy WCT Qualifier tournaments, Presented by Dechra Veterinary Products. Out of 4 contenders in the Open bracket, the 18-goal Women’s International Polo Network team made a winning debut with (from left) Cindy Halle, MVP Dawn Jones, Alyson Poor, and Anna Winslow receiving the Sunny Hale Memorial Trophy with a 9-5 win over 2nd place Boston Avalon. Eclair, owned by Cindy Halle was named Best Playing Pony. Five teams competed in the Handicap bracket, with 12-goal Heiades International’s Minnie Keating, Hannah Stowe, Lizzie Girard and MVP Izzy Parsons overtaking 2nd place Avalon Farm 7-1 for the Anne Hutchinson Perpetual Trophy. The commemorative Liberty Bowls presented on Independence weekend are symbolic of the New England region as the cradle of American democracy. Designed by silversmith & revolutionary hero, Paul Revere, the original Liberty bowl, signed by 92 leaders of the rebellion, is on permanent display at Boston’s Museum of Fine Arts. Hale, whose name is on the Open Memorial Trophy, is remembered as a passionate ambassador for the players and horses of polo, and considered to be one of the all-time greatest female polo players and role model for many women in the sport. Hutchinson, whose name is on the Handicap Perpetual Trophy, a champion of civil liberty and toleration in the colonial era, became the first woman to found a community in the New World (Portsmouth, Rhode Island – 1638, home of Newport Polo) and is revered in New England as a heroine of freedom. Hosted by Newport Polo in Newport County, RI and Myopia Polo Club, South Hamilton, MA from June 27-July 1, the tournaments drew a total of 9 teams with top level players from coast to coast and from overseas and 150 polo horses for spectacular and highly competitive polo over 5 days. In addition to competition, the players and their support entourage were welcomed by Discover Newport with a collector’s gift from RI’s ALEX AND ANI, and enjoyed Newport’s famed attractions including a sponsored sail on the Schooner Madeleine, a tour of the port’s night life, a Players Dinner at the iconic Clarke Cooke House and culinary favorites throughout the tournament. 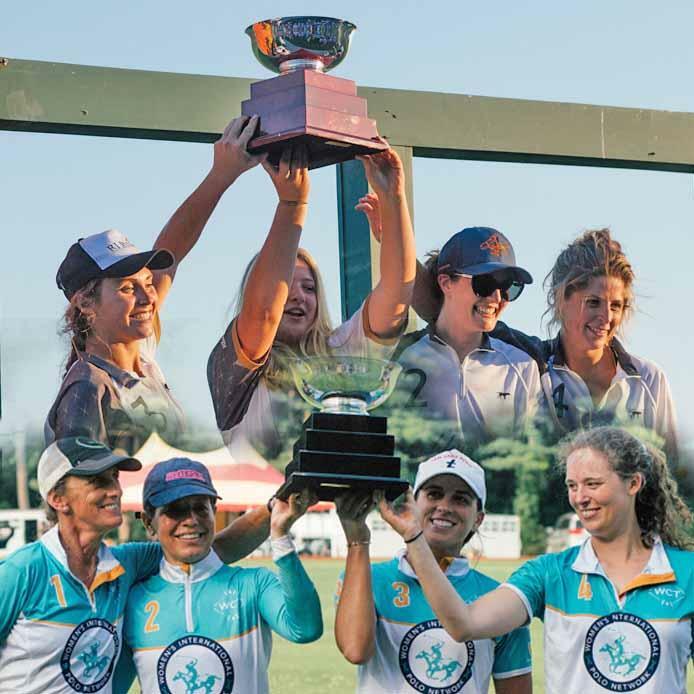 Sanctioned by the United States Polo Association (USPA), the tournaments are also Women’s Championship Tournament qualifiers for the "Sunny Hale Legacy WCT Finals" in Wellington Florida. Noteworthy high goal players including Dawn Jones introducing the Women’s International Polo Network, Courtney Asdourian, Isabelle Parsons, Paige McCabe, Cindy Halle, Alyson and Amanda Poor, Anna Winslow, Julia Steiner, Tiamo Hudspeth, and Athena Malin were among others that traveled to participate. The complete tournament rosters and scores are published on the USPA website. About Newport, Rhode Island: For more than 375 years, Newport has been welcoming visitors from near and far to its charming New England coastal harbor, earning its reputation as America’s First Resort. Evolving from its colonization for religious freedom to prominent colonial port to a destination ripe with sport, culture, history, art, entertainment and scenic beauty, distinctive shops, renowned restaurants, diverse accommodations and world-class events, its past, present, and future make this international resort uniquely legendary.